There are over half a million listed buildings in Britain, conservation areas can be found in every borough, and a large proportion of our housing stock pre-dates 1914. So, whether in extending a listed house, reordering a local church, or converting an historic warehouse, most architects will work with historic buildings at some point in their career – even if they are not a specialist conservation architect. An Introduction to Architectural Conservation aims to introduce non-specialist architects to the principles behind legislation concerning historic buildings. 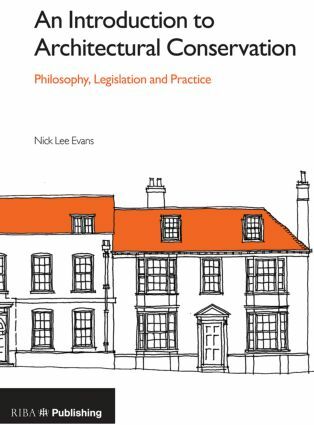 It will help them understand the practicalities of this legislation, the aims and objectives of Conservation Offices, Statutory Amenity Societies and other guardians of our heritage. With these skills, readers can advise clients more accurately, make successful listed building applications, and ensure their interventions are sensitive, appropriate and effective. An Introduction to Architectural Conservation is also a practical guide to good working practice: taking readers through the process of preparing a listed building application, preparing a suitable tender package and administering the contract. Containing an array of attractive and informative hand-drawn illustrations, An Introduction to Architectural Conservation will prove invaluable for architects who occasionally work on listed buildings and who may not yet be accredited. It is also an ideal source of reference for architects with existing specialist knowledge of the field. Nick Lee-Evans is the Managing Partner of the Lee Evans Partnership. He champions the concept of local distinctiveness, the innovative use of sustainable local materials, and the imaginative reuse of historic buildings. He has worked on numerous listed buildings, including barns, Napoleonic forts, and stately homes. Nick has a particular expertise in the design of church buildings seeking to respect historic fabric whilst adapting them to their current and future needs and mission: he is currently Inspecting Architect for over 20 listed Anglican churches and looks after several listed Methodist and URC churches as well. Nick has also chaired the RIBA Canterbury & District Branch for three years and lectures on professional practice to part 2 & 3 students at UCA Canterbury.